Desert Nights Casino is an online casino powered by Realtime Gaming owned by Deckmedia N.V..
You can play in Euro, Pound Sterling, South African Rand and United States Dollar. The website supports Dutch, English, French, German, Italian and Spanish language, players from US are welcome to register and play. 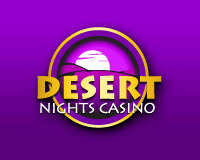 6 bonuses for Desert Nights Casino.